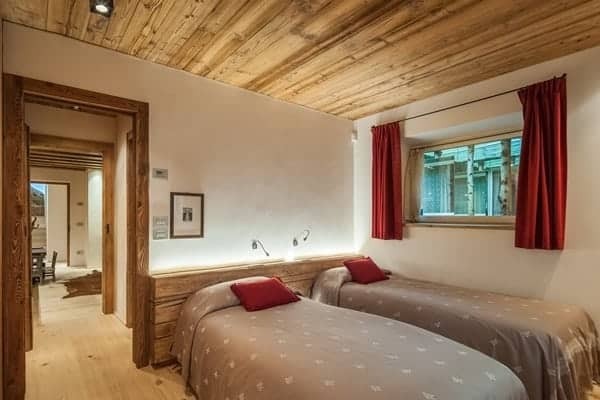 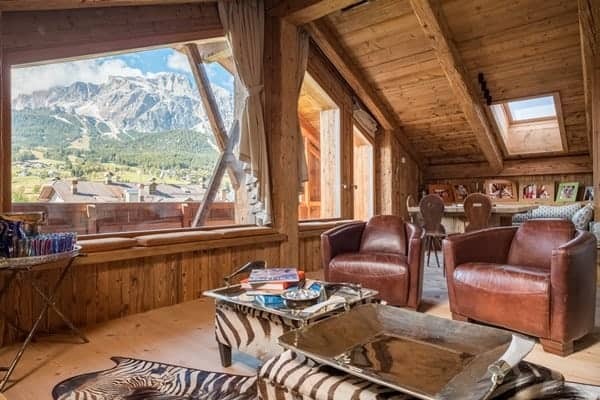 Cortina d’Ampezzo, the “Queen of the Dolomites” has in her very heart a resplendent chalet just a few steps from the pedestrian centre of this beautiful village. 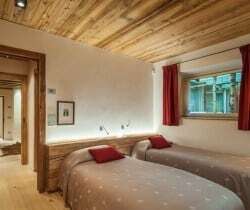 Live in the lap of luxury at Italy’s premier mountain resort, in the heart of the Dolomites, one of the unique regions in the World offering a memorable scenic and cultural experience for all seasons. 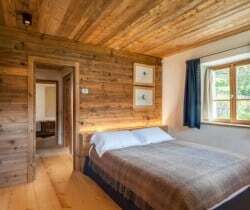 In Summer the area is a magnet for climbers and trekkers alike and in the Winter the resort is an eminent part of the Dolomiti Superski: one of the largest ski carousels in Europe comprising 12 ski areas, 450 lifts and more than 1,200 km of white slopes. 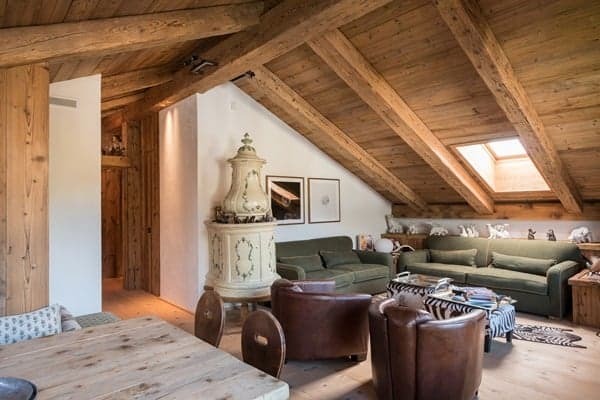 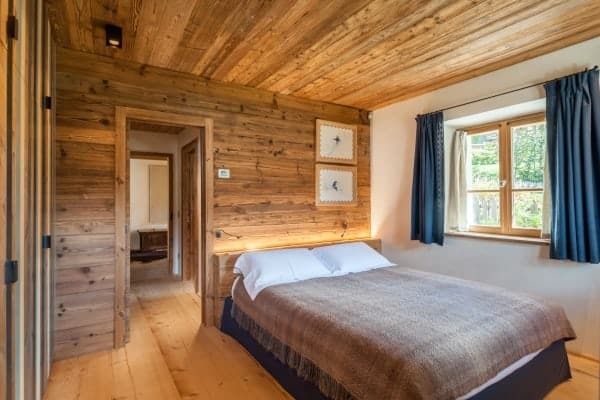 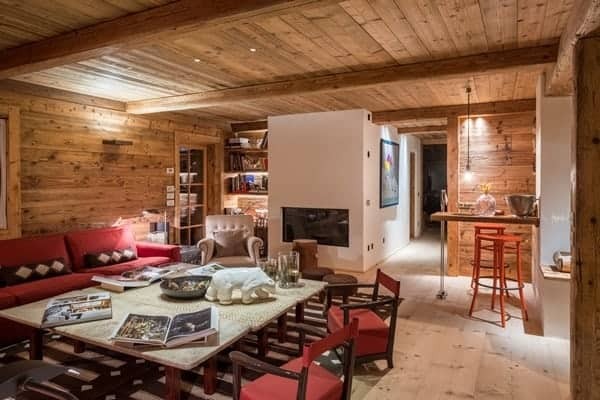 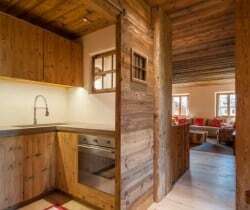 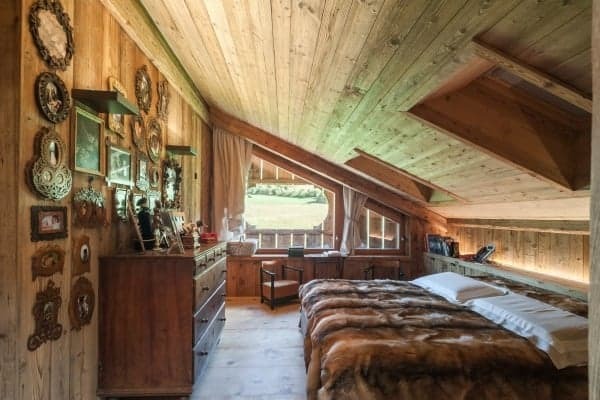 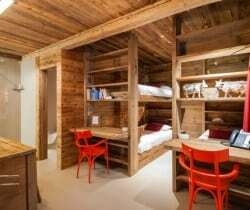 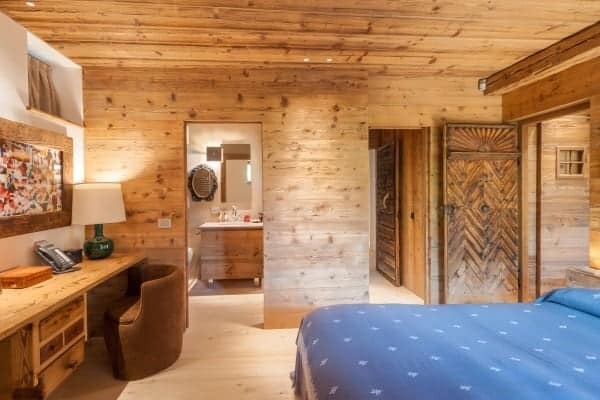 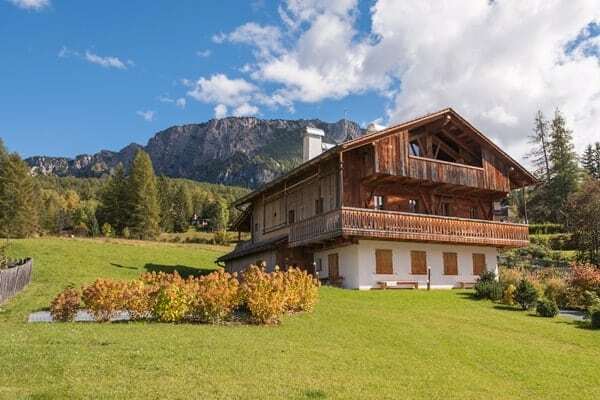 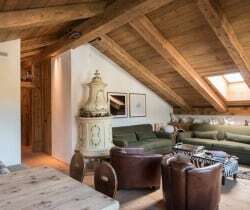 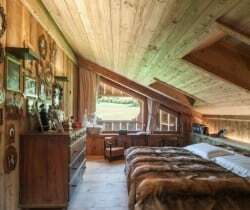 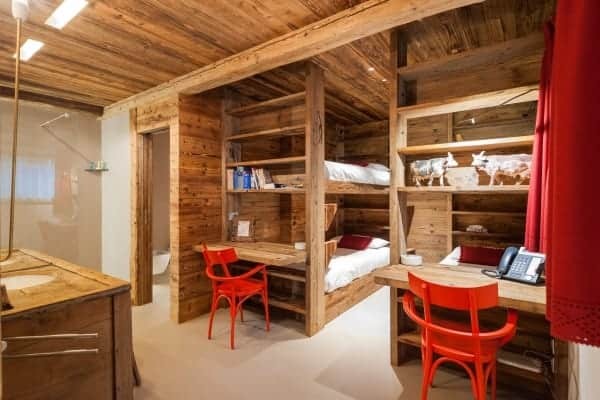 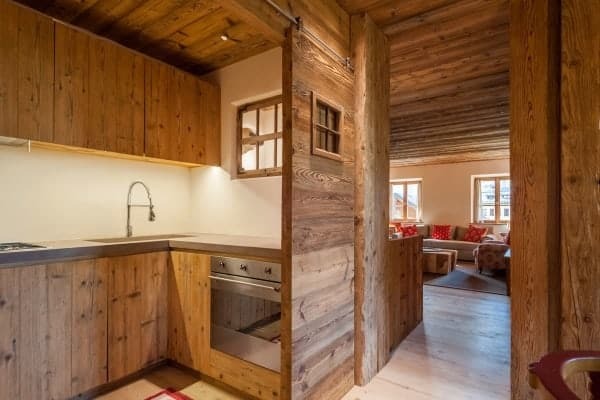 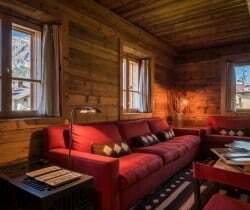 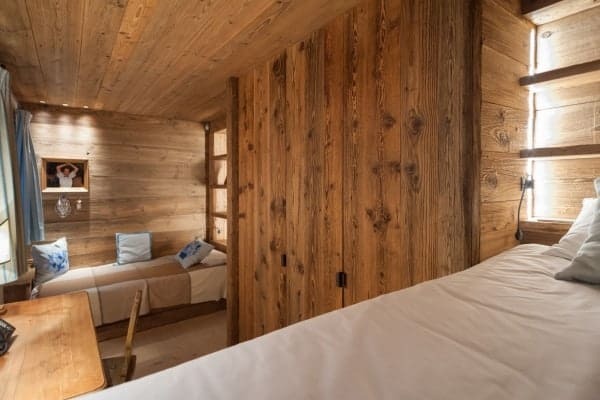 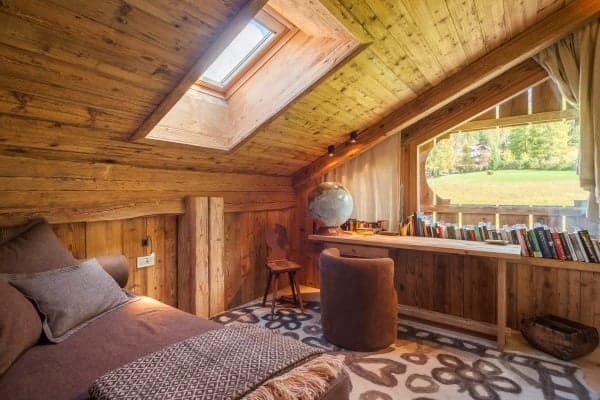 A lengthy renovation effort that started from an old barn has created what is arguably the best private luxury chalet in town and that is available to rent. 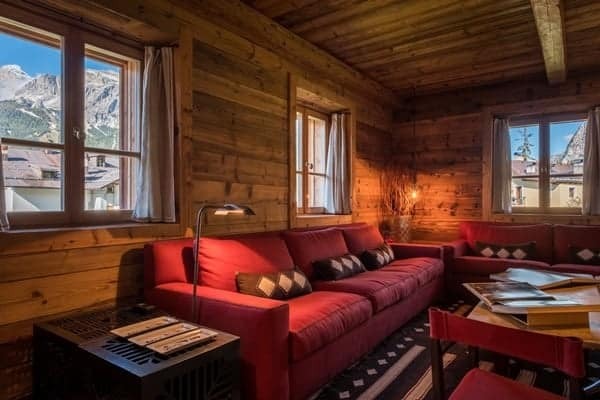 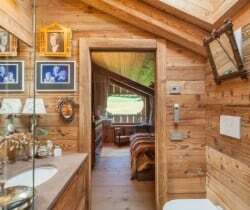 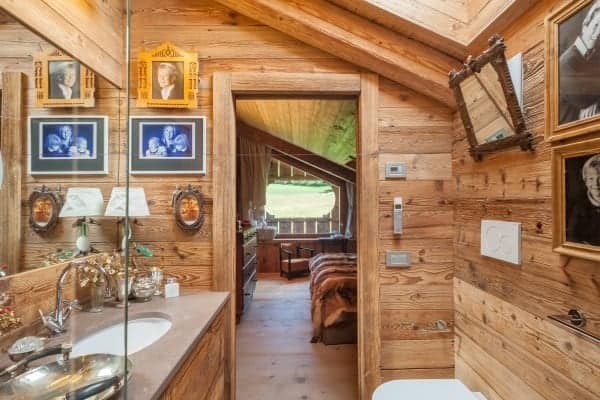 There is a relaxed ambience to this warm and woody chalet, which benefits from an adaptable arrangement of living and private spaces. 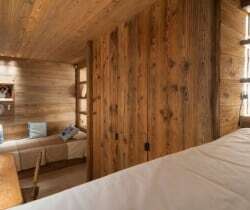 Deep and plush furnishings, warm, muted colours and lavish throws harmoniously offset the scrubbed wood walls and floors. 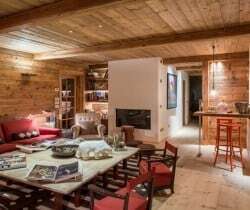 Discreet lighting plays its part too to add dramatic elements and surprise, from the kitchen and living areas to the bathrooms and bedrooms. 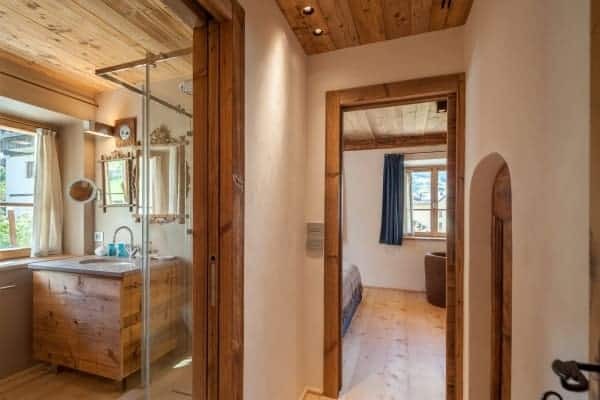 Shafts of natural light from outside and within stream into the stylish interior, which presents a cocoon of comfort within which there are exposed and featured stone walls, an enclosed glass forest and ornately carved and eye-catching interior windows. 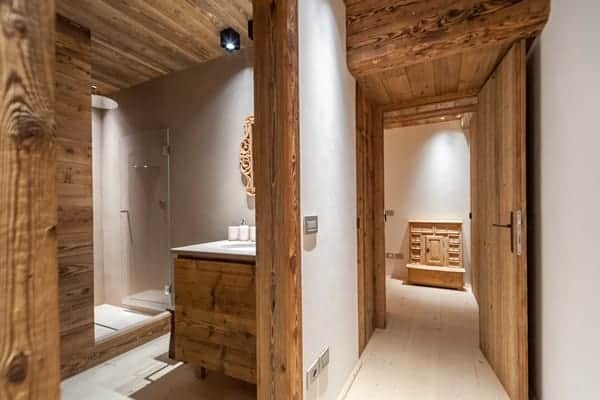 A generous indoor swimming pool and a compact high-tech fitness area are other unique features and located within a very comfortable and classy spa designed for luxurious rest and pampering in secluded bliss. 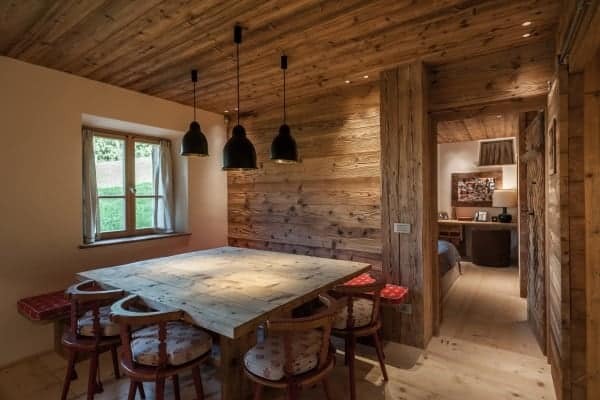 Outside this luxury is less dramatic and very natural, with a wide main terrace that overlooks the hills towards Monte Cristallo. 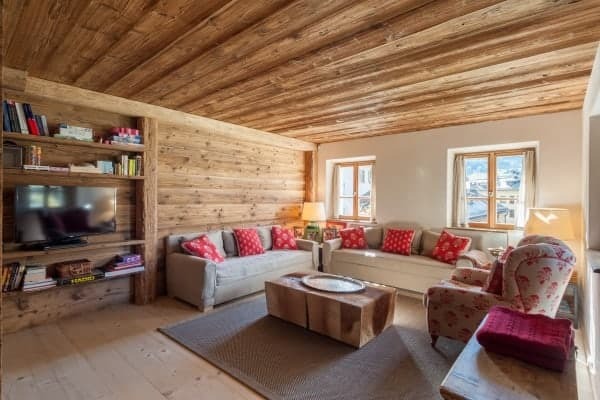 The luxury chalet comprises 5 floors and can accommodate up to a total of 20 guests (12/14 adults and 4/6 kids) in 9 bedrooms, which include a generous lower ground bunk bedroom (sleeps up to 4 people) and an independent master suite (with living areas, a kitchenette and a terrace with a stunning view on the 5 Torri) expertly arranged under the eaves. 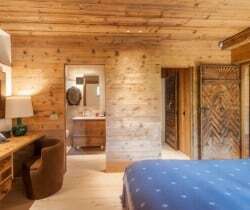 All rooms are furnished with great taste and a passion for detail and the artfully arranged bathrooms are fitted with designer fixtures and neatly set into wood surrounds. 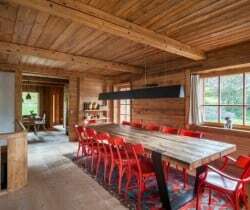 Family meals can be as fun and as grand as you wish around the antique wood dining table, which seats 14 on carved and crimson chairs. 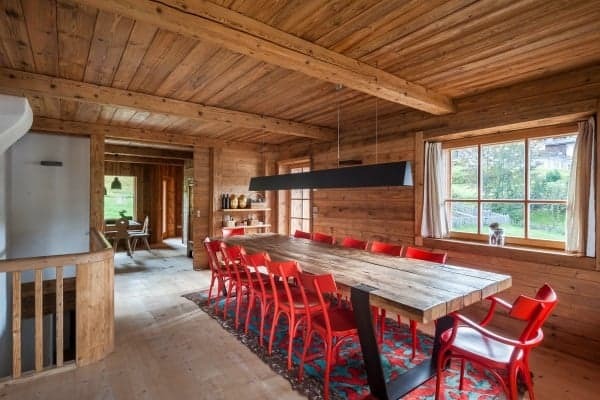 Overhead, a slither of light spans the full length of the table that will add flourish to any occasion. 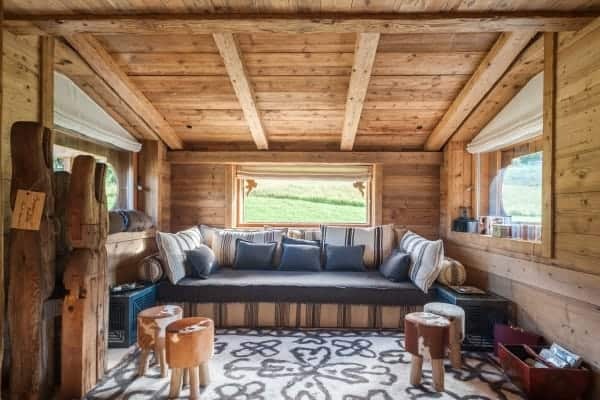 The garden and terrace burst with colour during the Spring and Summer offer are beguiling spaces for al fresco relaxation and socialising, as well as tempting opportunities for building snowmen with the kids in the Winter. 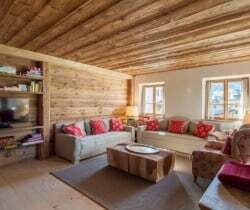 All told, this property is a great option for a family reunion in a luxurious haven in which guests of all ages will feel at home. 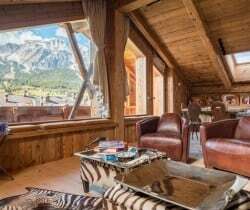 The quality of the chalet and the beauty and elegance of Cortina, with its smart après-ski bars, high street shops, restaurants and nightclubs are the right ingredients for a perfect holiday. 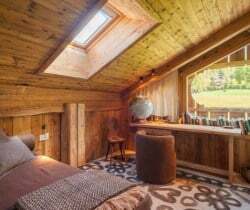 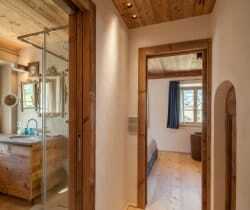 Last but not least, we will do our part to assist you with our services and make your stay in this luxury chalet just memorable.